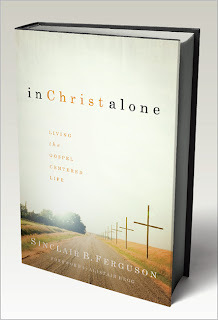 In Christ Alone: Living the Gospel Centered Life by Sinclair B. Ferguson, published by Reformation Trust (Lake Mary, FL: 2007), is a collection of articles originally published in Table talk and Eternity Magazine. The central theme of these articles is, obviously, our Lord Jesus Christ. I could perhaps title this review as Meeting Christ…Again, because this book introduces us to Jesus all over again. The chapters are short, just about four pages each, and are rather introductory level, but they tell us words about Christ that we need to be reminded of over and over again, no matter how far along we are in our Christian development. The chapters are arranged in six sections, each dealing with a different aspect of Christology. The first section, titled “The Word Became Flesh” deals with the questions of the deity and humanity of Christ, and of His role as servant and conqueror. Due to the shortness of the chapters, you will not find an exhaustive apologetic defending the deity of Christ, or like issues, but you will be provided with many Scripture references to support the orthodox position, which Ferguson takes. Ferguson briefly answers the question of why Jesus had to be a man. Short as the answer is, it is fully Scriptural and satisfying. He does not engage in philosophical speculation but always refers the reader back to the Scriptures. This section serves as an excellent Biblical introduction of just who Jesus really is. Part two, “The Heart of the Matter” goes from telling us Who Christ is in an introductory manner to telling us what He has done. An overview of the book of Romans explains reconciliation and justification in very clear, well-defined terms, showing how all of it is through Christ alone. Ferguson walks us through Hebrews, pointing out its Christ-glorifying messages on how Jesus is central in the history of redemption. Exposition is given on Jesus’ roles as High Priest and King. “The Spirit of Christ,“ the third section, moves to a discussion of the Holy Spirit, but in keeping with the Christological focus of the book, ties the Spirit to Christ. Dr. Ferguson explains about the Holy Spirit’s relation to Christ and how the Spirit is given from Christ. He also tells us why knowing about such things matters. He says, “it implies that Jesus bore the Spirit throughout His life in order to give us the same Spirit He bore. The Spirit He gives to us is the very same Spirit who accompanied and sustained our Lord Jesus throughout the whole of His ministry” (p. 78). In this section, we learn about revival and spiritual gifts, all the while keeping the focus on Jesus. In part four, we are shown “The Privileges of Grace”. We learn of our union with Christ, and of the oft-neglected but very sweet doctrine of our adoptions as sons of God and co-heirs with Christ. We are pointed to Christ’s words on the sovereign and monergistic work of God in regenerating our hearts. Ferguson teaches us of Jesus’ fulfillment and perfection of all the Old Testament types and shadows. He instructs us on the nature and work of faith, and finally, of our total assurance which can only be gained by trusting in Christ alone. Part five, “A Life of Wisdom,” begins to look more at our practice as Christians. Part of Biblical wisdom is to “be what we are”, that is, to live according to our professions and to be what God has turned us into. Ferguson shows us from the Bible how we are to live, to be discerning, and he tells us about our liberty in Christ, all of which are very practical issues. This section ends with an article on contentment, which is where wisdom leads us. Finally, in section six, “Faithful to the End”, Ferguson continues with more practical articles on our lives with Christ. I hate to use the word “practical” because all of the Bible is practical. But I use it in the technical sense of “pertaining to our actual practice”. I am digressing from the summary a little bit to ride my own hobby-horse here, but I really, really refuse to say that any part of the Bible is not “relevant”. I hate that word. And I’m sure Dr. Ferguson does as well, because he shows how doctrine is important to all of life. I don’t know if that was his intention in what I’m referring to, but it came through nonetheless. After speaking of Satan’s tendency to whisper to us that God doesn’t really love us after all, he writes, “What is our defense? Here is Paul’s: ‘God demonstrates His own love toward us, in that while we were still sinners, Christ died for us’ (Rom. 5:8). Let the cross silence the Devil’s slanders and convince you of the wonder of God’s love” (p. 199). The cross is so important for every reason. We must not think that the cross is just an elementary level topic and that we move on from there to bigger and better doctrines like how to get healthy and wealthy. We must always come back to the cross. Elsewhere in this section, Ferguson writes, “Only an understanding of how the gospel method works can provide an adequate foundation and pattern for dealing with sin” (p. 218), and “when we understand the ’glorious exchange’ principle of the gospel of grace, then we begin to make some real advances in holiness” (p. 221). So we see that all doctrine is practical. And thus ends my digression. Back to the book (though my digression is a logical conclusion after reading this excellent work, so I wasn’t straying too off-topic). Ferguson writes of the place of suffering for Christ, of the need for leaders to first be servants, and the nature of temptation. In a chapter on apostasy (specifically dealing with the apostasy passages in the book of Hebrews) Ferguson miraculously manages to say in just a couple pages what it takes most people to say in whole volumes. Here is a writer who knows how to choose his words carefully. There are no wasted phrases here; all is of benefit to the reader. The book concludes with Sinclair Ferguson’s account of a deceased friend of his who may or may not have inspired the title of this book with his life, which was lived in Christ alone. Thus Ferguson ends this excellent book with an encouragement to live our lives in Christ alone, in light of all that has been said. For students of the Reformation, the title of this book is immediately recognized as being one of the five sola slogans, but this book is about more than just that one. All of the solas run throughout this work, and I would imagine that this was not intentional on Ferguson’s part, but was just a natural byproduct of him being so thoroughly biblical in thought. Where we glory in Christ alone, we must necessarily glory in God alone. Much of the book is given over to grace and faith. And sola Scriptura is seen in Ferguson’s constant use of and reliance on Scripture. And when speaking on mortification of sin, he writes, “ The first thing to do is to turn to the Scriptures. Yes, turn to John Owen (never a bad idea!) or to some other counselor dead or alive. But remember that we have not been left only to good human resources in this area. We need to be taught from ‘the mouth of God’ if the principles we are learning to apply are to carry with them both the authority of God and the promise of God to make them work” (p. 217). I would recommend that you read this book with the Bible in one hand so that you can look up and meditate upon all the references that he provides. I am sure that this will be a rewarding experience as you are reminded from Scripture of the gloriousness of Christ. Speaking of that, this book would be excellent for a small group study, as I have recommended to my own Bible study group. A whole evening could easily be spent examining and discussing all of the Bible passages found in just one chapter. The chapters of the book often end in applicatory questions or statements that cause the reader to think about what he has just read and apply it to himself. And these aren’t just missiles sent into the consciences of those outside “our camp.” These were written for Reformed audiences, so the questions zing at us. For instance: “Do you know the Christ of the Gospels? Or have you fallen into the trap to which Christians (especially, perhaps, Reformed Christians) who love doctrine and systematic theology are sometimes susceptible (unlike John Calvin, it should be said): fascination with dogmatic formula at the expense of love for the Savior’s person?” (p.67). This isn’t just choir preaching. I can’t really think of anything negative to say. I found nothing in the theology to disagree with. The writing style is very interesting and engaging, much the way R. C. Sproul speaks. If I were to offer any negative criticisms, I guess it would be that the chapters are just too short. Now I understand that this was intentional, as the chapters were originally just little magazine articles. Nevertheless, perhaps a bibliography at the end to lead the reader to more literature on the topics talked about would be very useful. Ferguson whet my appetite for more on just about everything he wrote about. So yes, I would ask for some sort of recommended reading list. Also, this book uses end-notes instead of footnotes, and I hate that. But I guess that is the publisher’s fault and not the author’s. In all, I must say, what an excellent book! I am now eager to look for other works written by Ferguson, as this was my first substantial exposure to him. As Dr. Ferguson says of the atonement, so all of this book “is theology of the most exalted and mind-stunning nature” (p. 55).